Lily-of-the-valley can be a great choice to use as a ground cover. These delicate little white flowers also grow quite well in shade gardens and have a lovely fragrance. 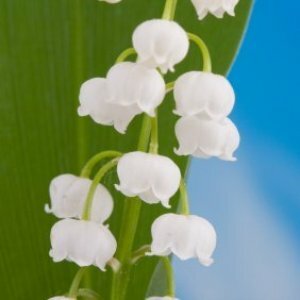 This is a guide about growing lily-of-the-valley. Start with purchased plants in early spring or fall. Plants should be spaced about 4 inches apart. Plants will benefit if mulched with 2-3 inches of compost to keep soil moist. Once established, Lily-of-the-Valley spreads slowly underground and can be propagated by dividing clumps of pips when plants are dormant in the spring or fall. These plants can become invasive and "take over" areas if not kept within boundaries. Lily-of-the Valley are often used in wedding bouquets for their fragrant delicate flowers that are not only white, but shaped like wedding bells. Three words that describe lily-of the-valley are beautiful, reliable, and fragrant. 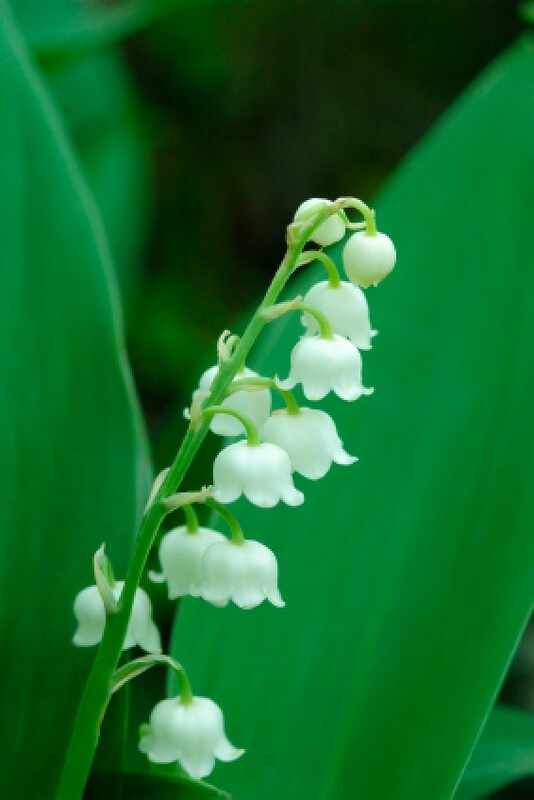 Its delightful sweet smelling, spring flowers are reason enough to grow them, but lily-of the-valley also offers reliable solutions to problem areas of the garden. Spread: Individual plants are small, but if not contained, they may quickly become invasive and spread through the garden. Flowers: Clusters of small, bell-shaped blooms on narrow, arching flower stalks, white or pink in color, and blooms in spring to early summer. Cut flowers for bouquets when bells are fully developed. The flowers usually last just over a week. Spring flowers are followed by attractive glossy orange berries. Foliage: Large, lance-shaped leaves of a deep glossy green. Light needs: Partial to full shade, but will tolerate full sun in cooler climates. Soil type: Prefers moist, well-drained soil; adaptable to less favorable conditions. Warning: ALL parts of this plant are poisonous if ingested. When introducing lily-of the-valley to your garden, seeding isn't recommended because it takes too long for plants to reach maturity. Instead, you will be planting "pips", small growth buds from the lily's underground rhizomes. They take only 1 to 2 years to produce flowers. Pips can be found at local nurseries or through mail order companies. The best time to plant them is in the early spring. Container grown plants are also available, which can be planted anytime during the growing season. Lily-of the-valley looks best when planted in masses. Pips should be planted about 1 inch deep, and spaced 3 to 4 inches apart. Most gardeners are familiar with the common green-leaved, white-flowered variety lily of the valley, but there are other varieties available as well. There is the pale pink-flowered 'Rosea', which is less fragrant; also the dapple-leaved 'Variegata', the white-striped 'Albostriata', the 'Aureovariegata' with yellow striped leaves, or Fortin's Giant, a taller variety that grows to a height of 12 inches. Lily-of the-valley combines well with other plants. Use it around the base of azaleas, rhododendrons, monkshood, or in combination with snow-in-summer and rockcress. It also pairs nicely with periwinkle and spring bulbs like daffodils. Lily of the valley is one of the few plants that thrive in the deep shade of mature trees. It provides a dense carpet of green leaves that remain attractive until fall frosts. In cooler climates, it will also grow well in full sun. The plants prefer moist, well-drained soil. They will readily adapt to dry conditions, although the plants may be paler in color, and produce less flowers. This makes them wonderfully versatile for filling in those trouble spots in the garden where other plants refuse to grow. Keeping lily-of the-valley contained: If your intentions is to use lily of the valley as a ground cover (e.g. on a steep slope), it can be allowed to spread indefinitely. However, because it spreads so rapidly, it can quickly become a pest when grown in the flower bed. Use edging, stones, or other barriers to contain its spread. Lily-of-the-valley has also been known to become invasive in forest settings, and should not be planted and allowed to grow unchecked near wooded areas. Caring for lily-of-the-valley couldn't be easier. Give plants growing under mature trees and shrubs a dose of slow release organic fertilizer each Spring. Otherwise, water plants periodically, and apply 1 to 2 inches of mulch at the base to help conserve water. In the spring, tidy up plants by removing last year's foliage. If leaf spot or stem rot occasionally cause problems, simply remove infected plant parts and destroy them. After a few years, lilies-of-the-valley growing in garden beds may start to become overcrowded. Dividing plants every few years will give them some breathing room and encourage the production of more flowers. I live in Massachusetts; do I need to cut back my lily of the valley patch? It is fall and a lot of the leaves have died back or are turning yellow. Some are still green. This is a new house, new garden, I don't want to kill anything! Thanks! Living in Massachusetts you will need to prepare these plants for winter. October is the best month to start preparing your lily of the valley plants for winter. Cut back any diseased or dead foliage. If there are small stands on the plant, cut all the top foliage off. You can cut these down to the ground level to keep your garden looking good during the winter months. It isn't necessary to cut back all the foliage on the plants. If the leaves are green, just leave them. They will either die or remain green during the winter months. If you have a large plant, cutting it all the way back to the soil isn't necessary. Leave the plant and let it remain like it is, so that it will feed your soil. These are hardy plants that thrive in USDA zones 2-7/9. Your plants should not require very much care except occasional trimming of dead or yellow leaves. You can cut/trim the yellow or dead leaves almost to the ground but leave the green leaves unless you just wish to cut the entire plant back. If left intact, the deciduous leaves turn a lovely golden hue in the fall, accompanied by colorful (but inedible) orange berries. Allow the foliage to remain after blooming as this will feed the pips for more flowers in the next spring. I planted my lilies of the valley 3 years ago in a semi shade spot. The white flowers are coming every spring, but they are very tiny and not flagrant. What I'm doing wrong? The flowers did spread a little during the years. Thank you. I find it very odd that your lilies do not have a nice fragrance as this is one of their strong points. Flowers are supposed to be small so I am not sure what you are referring to in size. Perhaps you can read up on taking care of these and maybe find something that you have missed doing when caring for them. How do you grow convallaria lily of the valley? I have got the bare roots, when do you plant them and what do you do with them? My lilly of the valley are in morning sun & afternoon shade. They are in, around & behind the iris. Mostly they like shade. Plant them in shade & you should be fine. 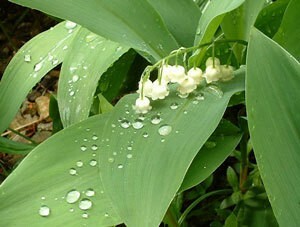 I have mail order lily of the valley. I had to trim off lots and lots of roots. If I plant the root without the pips will they develop pips or should I just toss them out?